My 3rd car was a 1962 MG Midget - (although I have a faint recollection of a short term light blue Ford Falcon before this). 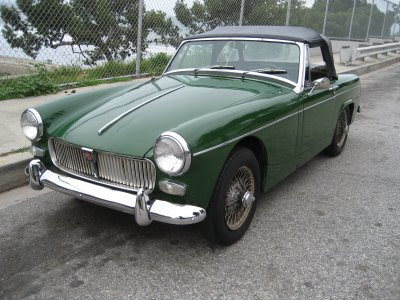 It was this same BRG (British Racing Green) and had same knockoff wire wheels (no bolts). Very comfortable, like sitting in a bathtub. I had Randy's Discount Food City when I bought this car - from my probation officer - interesting story. I was definitely inspired by my friend Ricky Carter's bug-eyed Sprite. I was living on Thames Street in Fells Point and a friend who had a similar Austin Sprite suggested that a mechanic friend, Lenny Taylor, could help me rebuild the engine, which we did. It was my automotive education. We dismantled and rebuilt the entire engine. Port and polished the head. What an adventure. Lenny had a profound effect on our lives. I used this car like a pick-up truck, going to the wholesale produce and fish markets early in the morning, even picking up Danny, who worked with me, before opening the store. One time, a basket of live crabs opened up on the way to the store. Got pulled over heading back from Mennonite country one time for swerving because I had it so overloaded with farm goods we were bringing back. What a fun car! Really loved it. What a crappy electrical system (Lucas). At least it was easy to push start, which I did by myself, MANY times.